ItemI-81610 - Mrs. Herman E. Dill. ItemI-81611 - Dr. D.H. Wallace. ItemI-81612 - The Reverend Van Munster of Nelson. ItemB-01697 - Bell belonging to the "Princess Victoria". ItemB-01700 - "Hagwilget Bridge near Hazelton. ItemB-01704 - The Hoops' ranch at Telkwa. ItemB-01708 - "Lake Kathlyn and Hudson's Bay Mountain, Smithers, BC". ItemB-01718 - The home of Dr. Cyril Wace. ItemB-01674 - "Entrance to Beacon Hill Park, Victoria, BC"; coloured postcard. 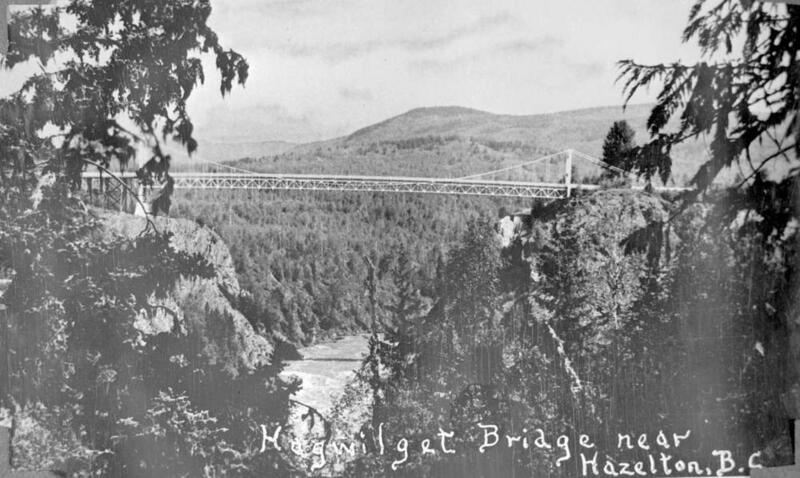 Item B-01700 - "Hagwilget Bridge near Hazelton.